Home Featured	Borderline Big Brother? Every day, the New York Police Department works vigorously to catch criminals, prevent terrorist attacks and ensure the safety of New Yorkers through the use of modern technology. However, the NYPD has faced criticism for the scale of their surveillance in recent years. New York City’s centralized technology center, which is called the Real Time Crime Center (RTCC), has been instrumental in expediting both federal and criminal cases for over a decade. 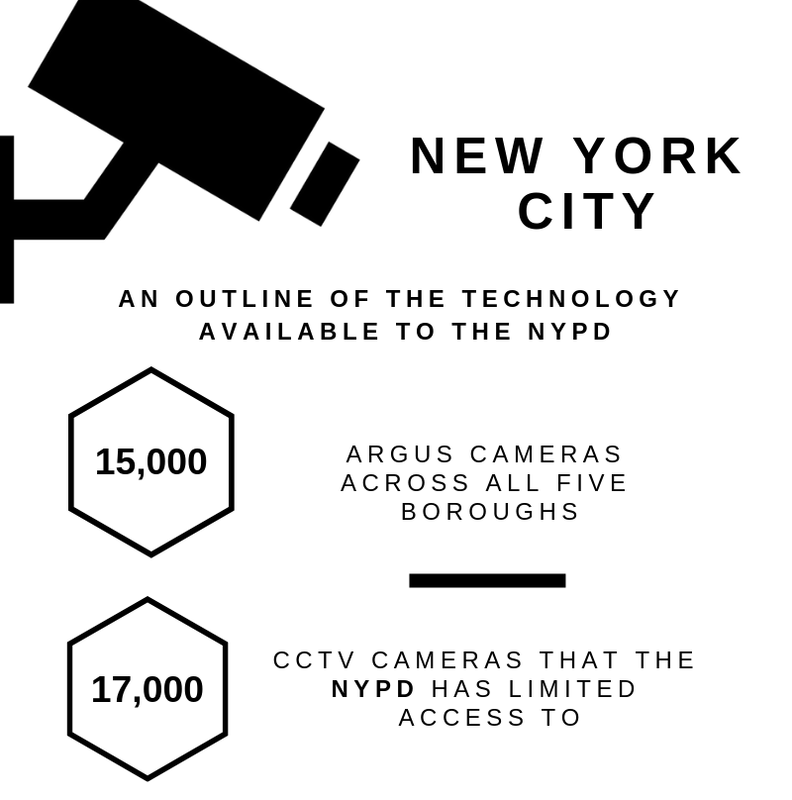 It has access to roughly 15,000 NYPD operated Argus cameras. 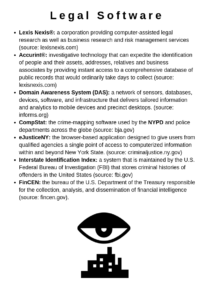 In addition to this, the NYPD has limited access to about 17,000 civilian Closed-Circuit TV (CCTV) cameras, which approximate to around 32,000 accessible cameras across New York City; police drones operated by the NYPD’s Tactical Assistance Response Unit (TARU) also belong to this arsenal of surveillance technology. Jonathan Stribling-Uss, a Media Democracy Fund Technologist Fellow at the NYCLU, calls NYPD monitoring a digital stop-and-frisk strategy. “We often lack good information about what the NYPD is actually doing, and they are not being transparent in the way that you would want [from] any agency with that much power,” Stribling-Uss said. Founded in 2005 under police commissioner Ray Kelly, New York City’s Real Time Crime Center was designed to be a reactive hub of information in constant, 24/7 operation. While the RTCC collects crucial information for cases, detectives in the field gather information that is later used in combination with RTCC data. Thus, diminishing some of the tediousness detectives face when working on cases. “If I have all my guys in the field interviewing witnesses, during that time the detectives at the RTCC can identify a person of interest… by the time [field detectives] get to the office they have information waiting for them,” said Detective Gilberto Ortiz, who currently works in the RTCC. Across the United States, RTCCs operate in major cities and counties; often working with neighboring areas and federal agencies like ATF and the FBI. Large-scale investigations rely on RTCCs to identify people of interest as well. These centers also make information accessible concerning vehicles and suspects involved in crimes via Mobile Data Terminals (MDTs) and a software called the Domain Awareness System (DAS), which allow officers to run license plates during traffic stops; DAS combines information gathered from cameras and crime-mapping software like CompStat. Some argue that the interconnectedness of technology that DAS utilizes lacks regulations and threatens personal privacy. “DAS makes it easy for the NYPD to undermine fundamental values and rights that we have in this country that [concern] our ability to have limited policing and a limited government in terms of not having abuses where you have police that are able to access all communication all of the time,” Stribling-Uss said. There is, undoubtedly, a great wealth of technology available to New York City’s Real Time Crime Center. This technology is capable of zeroing in on suspects and discovering information about everything from where they live to how many of their relatives are deceased. Where the line is drawn before personal privacy is invaded? It is unclear as to whether or not the technology available at the hands of the NYPD exceeds its perceived intrusiveness. The NYPD’s Facial Recognition Unit, which sifts through arrest records and compares them toe footage captured by a police-operated camera or cameras, was developed by the NSA. Joe Mesita, a retired detective of the NYPD, worked on an array of cases with the New York RTCC. He said that all requests that go through the RTCC are documented and must be part of an active case. Although the RTCC has access to live video feeds, it is solely a reactive unit; footage compiled by TARU and other divisions of the NYPD for surveillance is later sent to the RTCC for analysis. In a special report from the NYCLU, the organization criticized the NYPD when they made claims that Latinos and African Americans entering predominantly white neighborhoods could be targeted because of their race. In 2013, an artist by the name of Essam Attia created a fake NYPD ad that signified the big brother-like nature of the idea; it displays a military-style drone firing a missile at group of children and is captioned by the phrase “Drones: Protection When You Least Expect it.” Attia was shortly arrested after the NYPD caught wind of his ad campaign. 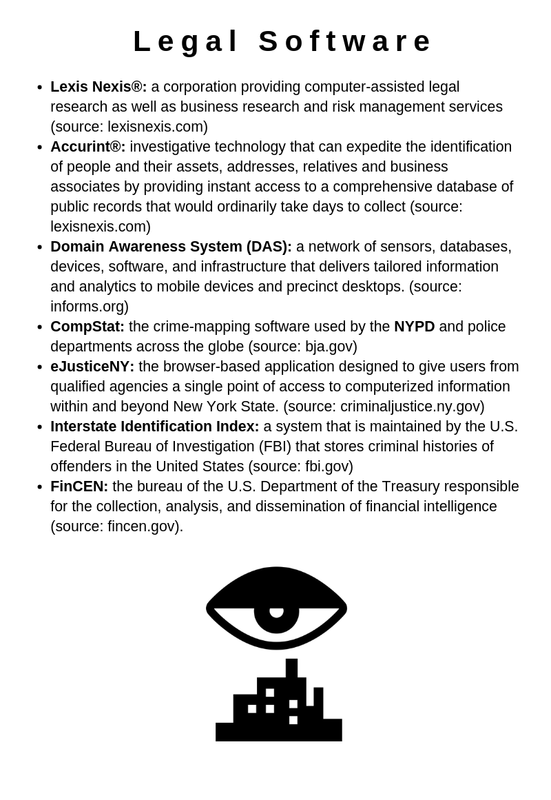 While some may feel safe knowing the NYPD has an interconnected system of cameras, databases, legal software and the like, others are uncomfortable. Stribling-Uss said the public needs to keep the pressure on police. “We need popular mobilization and engagement of people to get involved in pushing for their rights both in terms of demanding transparency from powerful institutions like the NYPD as well as upholding their own rights in ensuring larger government agencies are living up to their requirements in both constitutional and international law,” Stribling-Uss said. James Baratta is a first-year journalism major who definitely puts a piece of tape over his computer’s camera. You can reach them at jbaratta@ithaca.edu.